Kerala CM Vijayan said, “The Congress move is not in tune with the national political interest. When secular parties are making strong efforts to defeat the BJP, what message is he trying to send by contesting from Kerala." Twenty years after Sonia Gandhi contested from two seats — Rae Bareli in Uttar Pradesh and Bellary in Karnataka — Congress president Rahul Gandhi is said to be actively considering contesting from a Lok Sabha constituency in South India besides his traditional seat of Amethi in Uttar Pradesh. The Congress in Kerala indicated that he could contest from Wayanad, which is considered a party stronghold. The AICC did not deny the move, and neither did Rahul. While the AICC said a final decision is yet to be taken, top Congress leaders in Kerala — Oommen Chandy, Ramesh Chennithala and Mullappally Ramachandran — announced that they had urged Rahul to contest from Wayanad. And T Siddique, who was tipped to be the party’s candidate from Wayanad, pulled out from campaigning. Ramachandran said a final decision would be announced on Sunday. The idea is to project Rahul Gandhi as a leader with acceptance in the North and South. Barring Karnataka, the BJP does not have a presence in the South. The Congress doesn’t want Rahul to be tied down in Amethi, a sure Southern seat is a back-up. Meanwhile, the proposed move came under attack from both friends and foes. 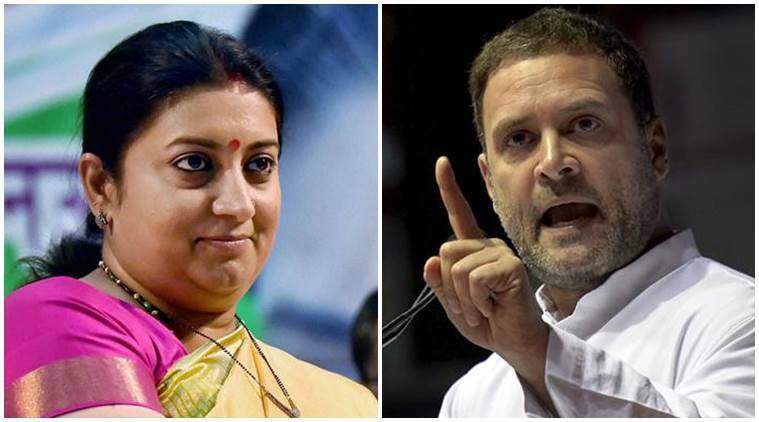 Union Minister Smriti Irani, Rahul’s opponent in Amethi, said the people of Amethi had driven him out. Apparently referring to reports about the PCC units in Kerala, Karnataka and Tamil Nadu asking Rahul to pick a constituency from their states, she said this was being staged because the people had rejected Rahul. Kerala Chief Minister Pinarayi Vijayan said that Rahul would send the wrong message. “The Congress move is not in tune with the national political interest. When secular parties are making strong efforts to defeat the BJP, what message is he trying to send by contesting from Kerala. It gives the impression that it is the Left that has to be destroyed. The Congress should introspect the decision. His presence is not going to change the poll battle in Kerala,” he said. While Rahul took to Twitter to attack the BJP government, he was silent on the reports. Ramachandran, who earlier said Rahul had accepted the state PCC’s proposal, later said it was the state unit’s unanimous wish. “It is the request of the secular and democratic people of the state. We hope there will be a favourable decision,’’ he said. The PCC leaders in Kerala, Karnataka and Tamil Nadu have been urging Rahul to pick a constituency from their states, arguing that his presence in the electoral fray in South India would give a big boost to the party across the region. The common refrain is that Sonia contested from two seats in 1999 — one from north and one from south — and that Indira Gandhi also picked a Lok Sabha constituency from South India — Chikmagalur in Karnataka — in the 1978 bypoll after Emergency. “The Kerala PCC unit has sent in their desire and request that Congress president should contest from there. We thank them for their effort as also expression of their love and affection, and the Congress president will positively consider it,” AICC communication department head Randeep Surjewala said in the afternoon. “Rahulji has, on more than one occasion, said that Amethi is his ‘Karambhoomi’ and shall always remain so. However, every time such a request or proposal comes, as desired by people of a particular state — in this case Kerala — we humbly bow and say, we thank you for your respect, affection and desire, and the Congress president will consider it in the same fashion,” he said. He later tweeted that similar demands had come from other southern states as well. “Southern state PCCs, lakhs of Congress workers & people of Karnataka, Tamil Nadu & Kerala have urged Sh Rahul Gandhi to contest Lok Sabha from these states. INC is indebted for the affection & blessings. Their sentiments are deeply valued & respected. Party will take a decision,” he tweeted. A senior Congress leader told The Indian Express that Rahul is yet to make up his mind. But Chennithala said he had spoken to UDF constituents like Muslim League and Kerala Congress (M), and they were also of the view that Rahul should contest from Kerala. He said Rahul would win by over 5 lakh votes if he contests from Kerala. The Congress, which heads the United Democratic Front in Kerala, is contesting 16 of the 20 Lok Sabha seats in the state. It has announced the names of 14 candidates — the party is yet to declare nominees for Wayanad and Vadakara. Former Kerala BJP president Kummanam Rajasekharan, who quit as Governor to contest from Thiruvananthapuram, said the move showed that the Congress would be wiped out in the North and North-East. The Wayanad Lok Sabha seat, set up after delimitation in 2009, comprises seven Assembly constituencies — Kalpetta, Mananthavady, Sulthan Bathery, Thiruvambady, Nilambur, Eranad and Vandoor. Of these, four are held by the CPI(M) and three by the Congress-led UDF. In 2009, Congress candidate M I Shanavas defeated CPI’s M Rahmathulla by over 1.5 lakh votes. In 2014, Shanavas retained the seat, but the victory margin shrunk to 20,000 votes. The seat fell vacant following Shanavas’s death in November 2018.